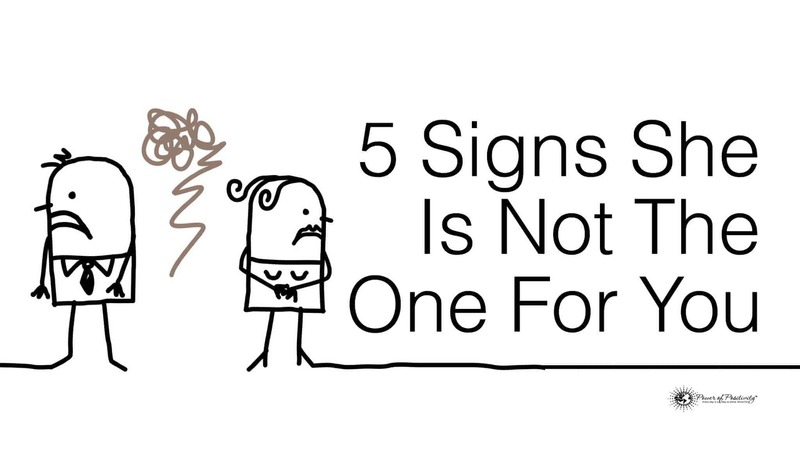 We hate to be the bearer of bad news, but if you and the woman you love share any of these 5 signs, then she might not be ‘The One’ for you. It’s not always easy to come to terms with the fact that you aren’t compatible. The good news is that you might be able to fix things. When love and expectations do not match up, there is a relationship disconnect that is very hard to repair. It might be better to walk away from the relationship rather than marry her if she’s not the One for you. When you are looking for ‘The One,’ you must be compatible with her in what is most important to you both, but you must also be ready to change part of your life to fit the needs of the most important woman to you. Your own beliefs, opinions, expectations, feelings, and actions can determine whether or not she is The One for you. One thing to keep in mind when looking for the woman who will be ‘The One’ for you; if she is younger than 50, she may still be interested in having children with someone who she sees as a good potential father. Researchers found that reproductive drives often push mate selection for women. Researchers say that women who are able to find a high-earning mate will tend to have more children. Also, with a mate who earns more, her children will be healthier and will be more likely to carry on her genetic line by having children of their own. People are capable of change, but only if they want to. If you want her to change something about herself, it will hurt her self-esteem to know that you do not accept her as she is. That wound of hurt that you have created by not loving and accepting her as she is, will eat away at her and make her angry at you. She is able to change when she puts her mind to it. If the change you want her to make is also one that she wants for herself, then she might still be The One for you. Ask her if this is something she also dislikes about herself and help her change. Otherwise, accept her ‘flaw’ as you see it, or move on. Preferences for character traits like sense of humor are different for women in different cultures, but one thing any woman is looking for in a mate is someone who treats her as his or her equal. Respect should be an automatic gift that you give any woman who you might think is ‘The One,’ but true equality is more than that. Treat your amazing female partner the way you would want to be treated. For example, regardless of her income, make sure that you both have a say in important financial decisions. She’s had those close relationships with family and friends long before you came along. It’s not likely that she will dump them all for you. If you can’t play nice with her family when you see each other then it’s not going to work out. Ultimately, the opinions of those close to her are very important when it comes time for her to choose her life partner. If her friends think you’re not her type, you might get the boot anyway. When you spend time with her close friends or family, resolve to be courteous, not take anything personally, and find a way to have a good time, even if an evening with her family is like going to see the dentist. The initial attraction is not enough to sustain a relationship with ‘The One.’ Make sure that you are blissfully happy just hanging out with her. Picture yourself old and sitting beside her in a rocking chair and ask yourself if you will still be happy. Alone time is a great time to check in with her and ask her if there’s anything she needs to talk to you about. Allowing her time to express her feelings while you listen is important to her. If you can’t handle the touchy-feely talk time, it’s a good sign that she, or any woman, is not likely The One for you right now. It’s hard to see a future together when your beloved wants to save the condors and you want to be a world-renowned pastry chef, but weirder combinations of ambitions and dreams do sometimes work out for couples. This future goal difference is only a real deal-breaker if you refuse to change or adapt your lifestyle to accommodate hers. What if you both moved to the Grand Canyon so she could save the condors and you opened a pastry shop on the rim for the millions of visitors each year? Even if your love does share some of these 5 signs in common, you might be able to repair things. Saving your relationship and making sure she chooses you as ‘The One’ could be as easy as a change of mind on YOUR part. If not, it’s too bad because she’s not ‘The One’ for you, but she will be ‘The One’ for the person who IS willing to change to help her achieve her dream.